I found this color on my new favorite site www.pinterest.com! So I just had to go out and get this exact polish. 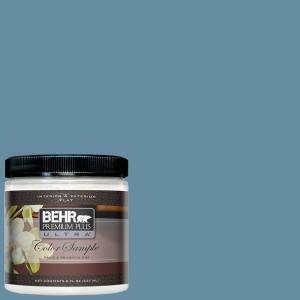 It is $5.99 at Sally Beauty Supply and it looks just like the Tiffany and Co. blue. It's not exact but it's close enough for me! So my wonderful husband called me today and said he would paint the bedroom for me! I am so excited. So after work I went to Home Depot and found the color I wanted. This is what our bedroom color is going to look like. It should look very similar to this color. I am also getting curtains (Dark Chocolate ones from Target) and I am getting new bedding. Here is the bedding I have been trying to decide on. I can't wait till it is all finished and it actually looks like a bedroom where we can relax! A week ago last Sunday, Brad went hunting. He would have rather slept in, but got up and went anyway. He ended up seeing 11 deer! 2 of which he shot and killed. 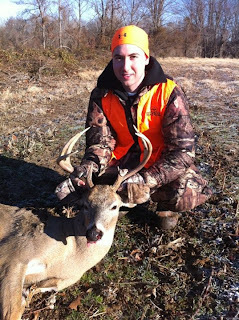 One of the two deer ended up being a 8 point buck! His biggest deer ever! I am very proud of him! Here is a picture of him and the deer. He is getting it mounted and he should have it withing 6 months or maybe a little longer. This past year was a really good year for me and Brad. We got to travel, buy and house, and even add Tyson to the family. Here are some pictures that reflect back on our year. Hope you enjoy. We went to Atlanta, Georgia and got to go to the Coke Factory. We took our first vacation to Panama City Beach and had an amazing time! We became home owners, which is probably the best part of 2010. Me and Brad celebrated our 1 year wedding anniversary on September 19 and I surprised him with a trip to Las Vegas. This is where we stayed (MGM Grand) and the picture below is Frozen Hot Chocolate from Serendipity 3. Hoping next year can be just as good as 2010! Last week I decided I needed to start working out again. I have been saying this for a few months but I have done nothing about it. 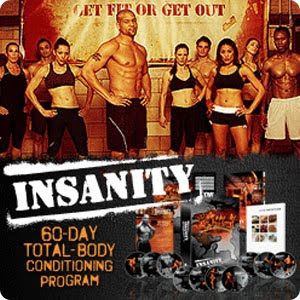 After doing P90X, I thought I could give INSANITY a try....This is probably the hardest workout I have ever done. It is a 60 day workout experience. I started last Monday (of course I took a few days off for Christmas) but I'm beginning to love it. It took me a while to figure out a schedule that I would stick to. Working out after I get home for work was not exactly working out for me so I had to change that. I now work out before work. Yes, that means getting up at 4:30 4-5 days a week in order to achieve my goals. I really thought I was going to be exhausted getting up that early but its actually the opposite. I feel amazing after! This has been one of the best investments I have ever bought. I no longer have to go to the gym, I can workout from my home! So, I thought I would give this another try and see if I can keep up with blogging. I love reading all my friend's blogs and thought maybe I should try and blog about whats going on in our life. We currently got a new puppy. He's a boxer and Brad named him Tyson. And yes, we still have Roxy. Here is a picture of the two of them together. We also became home owners as of August 31st, 2010! We absolutely love our new home. I am still trying to get everything in it's place but I only have 4-5 boxes left. I have already decorated the house for Christmas...I even did it BEFORE Thanksgiving...Only because I got so excited to be able to decorate our house! I will have to take some pictures of the decorations and put them on here. 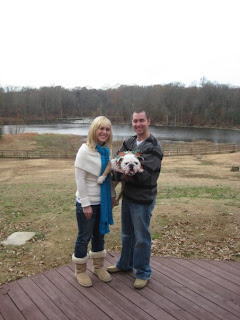 This is the picture we took when we bought the house....I am looking kinda rough, however, I did just get off of work. Here is a picture of the house before we moved in. The landscaping needs some work and we have done a some work on it but we will do a lot more when spring comes around. I thought I would go ahead and introduce the family. I have been married to my best friend for over a year now. We have been together about 3 years and love every minute of it! We have two dog, Roxy (n English bulldog), and Tyson (a Boxer). We love our life!